A team of researchers at Harvard University has discovered the means by which honeybees keep their temporary clumps intact during adverse weather conditions. In their paper published in the journal Nature Physics, the group describes their study of honeybee behaviour in their lab and what the found. Once a year, honeybees, led by a queen, leave their nests in droves to find a new home. But because it takes some time to find a site and build a new nest, there is a period when they have no place to live. 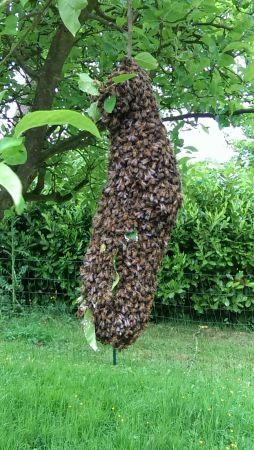 To protect themselves during this time, they congregate into masses that hang from tree branches—these clusters are made entirely of bees, each clinging to one another. In its most natural state, such clusters tend to form in the shape of a cone. But prior research has shown that the cone shape becomes flattened during inclement weather, such as when the wind blows. In this new effort, the researchers wondered how the honeybees knew what to do when adverse conditions arose. To find out, they gathered bees from the wild and put them in a container in their lab where they were allowed to form a cluster, dangling from a movable apparatus. Once a cluster formed, the researchers moved the apparatus to pull the cluster back and forth, simulating the impact of wind pushing the branch upon which they hung. As the researchers watched, the cluster slowly flattened, hugging the apparatus. A flatter shape, the researchers noted, would reduce pressure from the wind, just as it would for a person lying on the ground versus standing up. By studying slow-motion video of the bees and tracking the movement of those on the surface of the cluster, the researchers developed a theory—they believed that the bees, upon feeling pulled from the bees they were holding on to, moved themselves to a place of higher stress. To test this theory, the group created a computer simulation of the honeybees and their cluster and then gave those on the outer surface the ability to feel stress and to react to it by moving to a position of higher stress. They found the virtual bees changed the shape of their cluster in the same way as did those in the real one, offering strong evidence that their theory was correct.